I like the lighting and the shading you did on her. Quick... Mmm... How many minutes exactly? Because for many this is far to be quickly drawn. Still, wonderful work for a quick one. 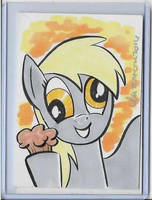 Derpy and her lucky muffin! Uh, looks like her strabismus has been cured! But I still hope she won't lose her muffin-in-a-jar. Her little happiness built from these simple things is desperately fragile. The lighting is really on point, great work. She looks great ! The light is amazing !